Equatorial waves are ocean waves trapped close to the equator, meaning that they decay rapidly away from the equator, but can propagate in the longitudinal and vertical directions. Wave trapping is the result of the Earth's rotation and its spherical shape which combine to cause the magnitude of the Coriolis force to increase rapidly away from the equator. Equatorial waves are present in both the tropical atmosphere and ocean and play an important role in the evolution of many climate phenomena such as El Niño. Many physical processes may excite equatorial waves including, in the case of the atmosphere, diabatic heat release associated with cloud formation, and in the case of the ocean, anomalous changes in the strength or direction of the trade winds. Equatorial waves may be separated into a series of subclasses depending on their fundamental dynamics (which also influences their typical periods and speeds and directions of propagation). At shortest periods are the equatorial gravity waves while the longest periods are associated with the equatorial Rossby waves. In addition to these two extreme subclasses, there are two special subclasses of equatorial waves known as the mixed Rossby-gravity wave (also known as the Yanai wave) and the equatorial Kelvin wave. The latter two share the characteristics that they can have any period and also that they may carry energy only in an eastward (never westward) direction. The remainder of this article discusses the relationship between the period of these waves, their wavelength in the zonal (east-west) direction and their speeds for a simplified ocean. Once the frequency relation is formulated in terms of ω, the angular frequency, the problem can be solved with 3 distinct solutions. These three solutions correspond to the equatorial gravity waves, the equatorially trapped Rossby waves and the mixed Rossby-gravity wave (which has some of the characteristics of the former two). Equatorial gravity waves can be either westward- or eastward-propagating. Discovered by Lord Kelvin, coastal Kelvin waves are trapped close to coasts and propagate along coasts in the Northern Hemisphere such that the coast is to the right of the alongshore direction of propagation (and to the left in the Southern Hemisphere). Equatorial Kelvin waves behave somewhat as if there were a wall at the equator – so that the equator is to the right of the direction of along-equator propagation in the Northern Hemisphere and to the left of the direction of propagation in the Southern Hemisphere, both of which are consistent with eastward propagation along the equator. The governing equations for these equatorial waves are similar to those presented above, except that there is no meridional velocity component (that is, no flow in the north–south direction). The solution to these equations yields the following phase speed: c2 = gH; this result is the same speed as for shallow-water gravity waves without the effect of Earth’s rotation. Therefore, these waves are non-dispersive (because the phase speed is not a function of the zonal wavenumber). Also, these Kelvin waves only propagate towards the east (because as Φ approaches zero, y approaches infinity). Kelvin waves have been connected to El Niño (beginning in the Northern Hemisphere winter months) in recent years in terms of precursors to this atmospheric and oceanic phenomenon. Many scientists have utilized coupled atmosphere–ocean models to simulate an El Niño Southern Oscillation (ENSO) event and have stated that the Madden–Julian oscillation (MJO) can trigger oceanic Kelvin waves throughout its 30- to 60-day cycle or the latent heat of condensation can be released (from intense convection) resulting in Kelvin waves as well; this process can then signal the onset of an El Niño event. The weak low pressure in the Indian Ocean (due to the MJO) typically propagates eastward into the North Pacific Ocean and can produce easterly winds. These easterly winds can transfer West Pacific warm water toward the east, thereby exciting a Kelvin wave, which in this sense can be thought of as a warm-water anomaly that travels under the ocean’s surface at a depth of about 150 meters. This wave can be observed at the surface by a slight rise in sea surface height of about 8 cm (associated with a depression of the thermocline) and an SST increase that covers hundreds of square miles across the surface of the ocean. 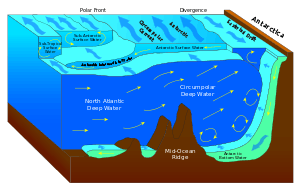 If the Kelvin wave hits the South American coast (specifically Ecuador), its warm water gets transferred upward, which creates a large warm pool at the surface. That warm water also starts to flow southward along the coast of Peru and north towards Central America and Mexico, and may reach parts of Northern California; the wave can then be tracked primarily using an array of 70 buoys anchored along the entire width of equatorial Pacific Ocean, from Papua New Guinea to the Ecuador coast. Temperature sensors are placed at different depths along the buoys' anchor-lines and are then able to record sub-surface water temperature. The sensors send their data in real-time using a satellite to a central processing facility. These temperature measurements are then compared and contrasted to historically and seasonally adjusted average water temperatures for each buoy location. Some results indicate deviations from the 'normal' expected temperatures. Such deviations are referred to as anomalies and can be thought of as either warmer-than-normal (El Niño) or cooler-than-normal (La Niña) conditions. The overall ENSO cycle can be explained as follows (in terms of the wave propagation throughout the Pacific Ocean): ENSO begins with a warm pool traveling from the western Pacific to the eastern Pacific in the form of Kelvin waves (the waves carry the warm SSTs) that resulted from the MJO. After approximately 3 to 4 months of propagation across the Pacific (along the equatorial region), the Kelvin waves reach the western coast of South America and interact (merge/mix) with the cooler Peru current system. This causes a rise in sea levels and sea level temperatures in the general region. Upon reaching the coast, the water turns to the north and south and results in El Niño conditions to the south. Because of the changes in sea-level and sea-temperature due to the Kelvin waves, an infinite number of Rossby waves are generated and move back over the Pacific. Rossby waves then enter the equation and, as previously stated, move at lower velocities than the Kelvin waves and can take anywhere from nine months to four years to fully cross the Pacific Ocean basin (from boundary to boundary). And because these waves are equatorial in nature, they decay rapidly as distance from the equator increases; thus, as they move away from the equator, their speed decreases as well, resulting in a wave delay. When the Rossby waves reach the western Pacific they ricochet off the coast and become Kelvin waves and then propagate back across the Pacific in the direction of the South America coast. Upon return, however, the waves decrease the sea-level (reducing the depression in the thermocline) and sea surface temperature, thereby returning the area to normal or sometimes La Niña conditions. Note that h is the depth of the fluid (similar to the equivalent depth and analoguous to H in the primitive equations listed above for Rossby-gravity and Kelvin waves), KT is temperature diffusion, KE is eddy diffusivity, and τ is the wind stress in either the x or y directions. 1 2 3 4 5 6 7 Holton, James R., 2004: An Introduction to Dynamic Meteorology. Elsevier Academic Press, Burlington, MA, pp. 394–400. 1 2 3 4 5 6 7 8 “El Niño and La Nina,” 2008: Stormsurf, http://www.stormsurf.com/page2/tutorials/enso.shtml. 1 2 3 4 5 6 7 8 The El Niño/Earth Science Virtual Classroom, 2008: “Introduction to El Niño,” http://library.thinkquest.org/3356/main/course/moreintro.html.